Microcap Manager Review October 2018 Not for the faint hearted! HI Graeme I am afraid not as some LIC's report portfolio returns which would be similar to trust returns and others base it on pre-tax nta performance over time. However, you do get broad themes and general performance trends and observations on the asset class and individual managers over time which can serve as a starting point for further research work by readers. Hi Tarluck I don't have a view as they are merely opening an existing fund to retail instead of previously restricting it to wholesale investors only. So it is not a new product offering but a different share class. Having a long track record does though provide some good information for retail investors to review with their financial advisor as to the suitability of the retail share class for that particular investor. Hi Stan I don't think they should have perfect negative correlation but the returns should differ significantly to those broader indexes which is what happened in 2018. Microcaps are still equities so they will have some correlation with the overall asset class. Also as we saw in the GFC in times of great investor stress all asset classes started to become more correlated with each other. I take your point on the Ausbil holdings but there is no hard and fast rule between managers as to what they constitute as a microcap stock. Some like Ausbil is mainly shares outside the top 200, others it's the top 300, others its anything under the $500m market cap. Some mix a bit small cap and microcap into the one fund but may name it a microcap fund. My own personal view is anything that under the $300m market cap. Hope that gives you some context on the funds I have included. Hi Owen, Many thanks for the comment I decided to leave this particular cash option out of the article in order to focus on the highest potential return arbitrage which is via the scrip option. However, as you rightly point out this 20,000 shares for cash option is also a nice arbitrage play and should not to be discounted. Hi Harley One intriguing scenario not sketched out in your thesis could be CUP on its own accord buying Count. A long shot maybe but certainly not beyond the realms of possibility. Many thanks for the analysis an intriguing little stock story and one to keep an eye on as it plays out. Hi James, KAT cant be consider because they focus more on mid and large caps. A quick look at their last NTA and names like NAB, RRL, CGF, WBC, MQG, HSO. The market caps of these names are well above micro and small cap levels. Hi Graeme, Many thanks for the feedback. Please see an extract from the SPIVA report as to the benchmark used for small and mid-cap managers below. The choice of benchmark used by the funds or by investors for performance comparisons is a subjective area. Some managers use the Small Ords as you say but don't invest in junior miners & resource companies. So in 2016 that would have been great as industrial stocks were doing well and miners & resources couldn't catch a bid. Today, the same fund would be finding it difficult to match benchmark returns as the performance of the two sectors has inverted. The All Ords Index has still returned 7.86% over the last 5 years. That's still a decent absolute hurdle for a manager to outperform net of fees. So while the makeup of the index I agree might not be applicable or comparable the index can still provide a decent hurdle/benchmark for an active manager to overcome. "The S&P/ASX Mid-Small is designed to measure the performance of companies included in the S&P/ASX 300, but not in the S&P/ASX 50. It is a combination of the S&P/ASX MidCap 50 and the S&P/ASX Small Ordinaries." Hi Claude, Many thanks for the feedback. That’s is my ultiamte goal. To bring industrial type microcaps to a wider audience. I hope you enjoy future editions as much as the current. I will try for the next report James no problem. Might also be a combination of old age, noticed a few grey hairs in recent BHS videos. Thanks, Huiyi I think anything they do will be a lot more measured going forward given previous experiences by management. I get the sense management still see opportunities for growth but investing in growth will be far more circumspect and will need hit key milestones before more capital will be deployed. I don't see any "big bang" type initiatives or investments. Slow and steady wins the race as they say although the market can sometimes be impatient when it comes to this strategy. Hi Martin Thanks for the comment I will try and tackle each of your points raised Investors need something to measure the performance of the manager against and while outperformance versus a benchmark is by the no means the only criteria that could or should be used it is at least a starting point. So I think it is important to put benchmarks performances in the report. The managers also need some reference point or base if they charge performance fees so again benchmarks fulfil this function. If investors feel neither of these two benchmarks are relevant to the managers they could always perhaps use the long term returns of the Australian market (circa 10%) as an absolute measure to see how the managers track records stack up against it. I include the performance of the All Ordinaries Index to try and reflect this. 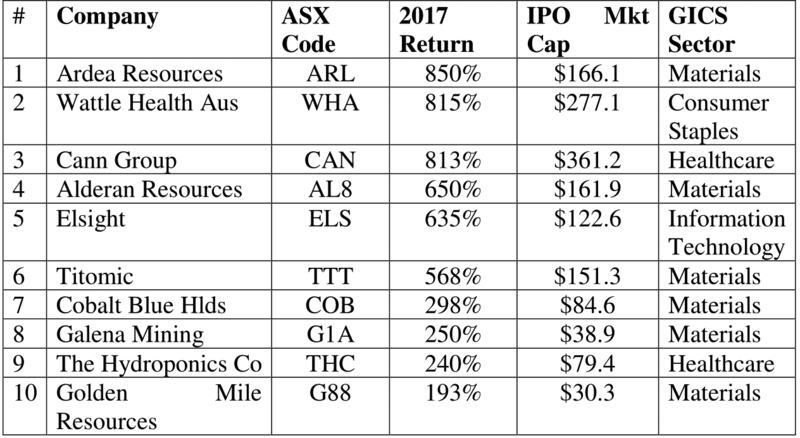 These are the two most relevant benchmarks I am aware of for Australian microcap managers but if you have suggestions for more appropriate benchmarks for inclusion in the next report I will happily consider adding them for comparative purposes. All the above are active managers and you want active managers to actively allocate capital differently to the underlying index benchmark. You don’t want to be paying active fees for index hugging. So, their portfolio should look different in terms of stock selections and sector weightings versus the benchmark. Yes, there is a large weighting to resources and indeed technology in the emerging companies index. If these sectors are performing very well some of the active managers may actually underperform the index and vice versa if these sectors are under performing the managers may do well, but that is what you are paying the managers to do. Allocate your capital to the best performing companies and sectors in order to generate alpha. If we look at the emerging companies index the median market cap is shade under $200mil with the general industry standard being $300m and under being regarded as microcaps. So, with 50% of the index names well under that $300m threshold I think that the emerging companies index is at least a reasonable benchmark to compare these active microcap managers against. Hi, Ivan indeed and as they say a good start is half the battle. A long way to go yet and by no means guaranteed. However with the strong management team in place and a favourable macro environment currently I believe they are well positioned to execute on their strategy and my investment thesis to hopefully play out as planned. Hi, James, the QVG Capital offering is more a pure small-cap fund than microcap fund. I am sure they will have a few microcap names in the portfolio from time to time but not enough to warrant inclusion into the review. Current top 5 positions are all above $300mil market cap which is our benchmark for classification of microcaps. Hi, Boyd as a LIC, the shareholders will have the right vote on who they appoint as the relevant IM to manage the portfolio on their behalf. The microcap and small-cap space in Australia is blessed with many fine active managers with great track records, ultimately, however, shareholders must vote as to who they want in place as the IM even though this may be odds with ones one opinion on the best IM for the mandate. Hi, Martin could please share the name and author(s) of the study referred to in the article? Hi, Alan many thanks for the kind feedback. That is what I hope to try and provide to the Livewire audience, stocks which are under the radar. As noted in a previous article running screens on microcaps is nowhere near perfect due to the poor quality of the data these screens are run on. HRL just another case in point. Good luck with your holding hopefully this interesting story plays out as the strategy implies. Hi Thom, noted I am planning on doing a mid year review in Jan 18 and I will add it in then. 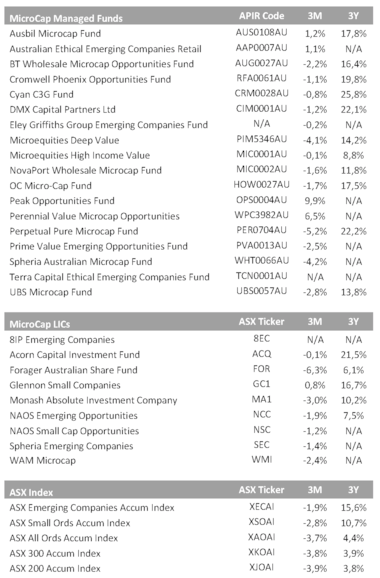 I do know however that the ASX Small Ords Industrials did +7.9% for the year which was only marginally ahead of the ASX Small Ords at 7.0% Most microcap managers handily outperformed either index if you look at the table in my first article for FY17 at least. Hi, Graeme, I have asked the people at S&P who produce the SPIVA report to consider adding microcap asset class to their Australia 2017 report this will then tackle the issue of survivorship basis as you point out. Hi Chad, Another trading strategy is to buy the options for say $0.02 then convert them at $1.10 so your all in cost is $1.12 (plus some brokerage). Then you can sell the shares at $1.20. Profit of $0.08. I have found the pricing of LIC options to be very misunderstood generally by investors and this can cause dislocations that can be capitalised upon. Thanks James hopefully have a few more coming through later in the year. Hi James Yes and no. ATM's of the future will be like mini banks where you can also deposit cash for example (STL planning on rolling this breed of ATM out in AUS) along with more expanded service compared to today. They are also moving into EFTPOS and all the backend processing of transactions which still needs to be done for Visa Paywave/Mastercard Paypass or standard ATM transactions. Cash will also be with us for a fair while yet in my view. Hi Graeme many thanks for the historical perspective. However I can only speak to the current position BWF finds itself in and its current performance. Hopefully the WOTSO concept will continue to deliver results to shareholders new and old. I will however carefully monitor any proposed restructures or capital management initiatives given the insight you have provided. Hi Boyd One man involved in this story who can without doubt answer yes to both the questions you raised is Geoff Wilson, in the interest of full disclosure I used to work at Wilson Asset Managment and can honestly say Geoff on many occasions has fought for shareholder rights and especially small shareholders rights. Some of his previous activism has also caused many a share to rise and benefited all shareholders. Geoff's efforts in the RHG/John Kinghorn battle spring to mind. Ireland also recovering very strongly. 4.8% GDP growth in 2014 the fastest in the EU. Feedback from on the ground is that 2015 continuing in the same vein. So should be good for Harvey Normans Ireland operations. JYC:ASX nice update just before Christmas. Profit in its Bedshed and KWB Kitchen Connection retail businesses expected to finish the December 2014 half well above last year, with double digit growth Board to review strategic plans with this site on the Moorebank industrial property early in the new year. Have received solid interest according to the update. Seeking additional retail growth opps and welcome suitable enquiry to the executive director. This is a little nanocap with a potential nice asset sale and cash to look at more retail opportunities with or without the sale. Not an upgrade James Marlay basically a continuation of 2H14 run rate into 1H15 but it is an improvement on the PCP. Even if they do the same in the 2H15 it will still be good growth in FY15 on FY14. This 1800 business is pretty stable, there are a few regulatory changes in the works but mgt have said they don't expect any major impacts. They are working on getting it running as efficiently and effectively as possible. This is a mature stable business and basically a cash cow. It helps to generate to cash to fund growth ops in my view.